If you’ve ever taken a New York City bus, you probably have a horror story. Maybe you were late to school thanks to a double-parked motorist idling in the bus lane, or missed an appointment after you waited 20 minutes for a bus to show up, then three arrived all at the same time, already packed with riders. Now you can tell your elected representatives to fix these problems via the Riders Alliance’s “Woes on the Bus” campaign. 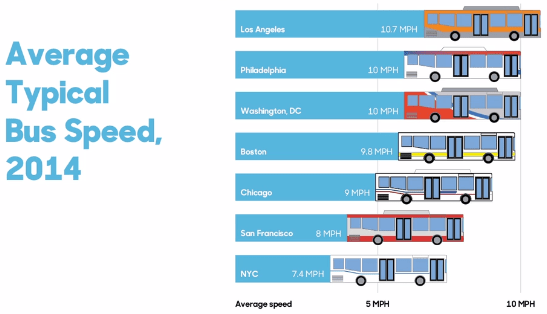 With an average speed of 7.4 miles per hour, NYC’s buses are the slowest in the nation. The good news is that there are lots of proven ideas to turn around the system. A coalition of transit advocates is calling for “tap and go” fare collection and all-door boarding, more dedicated bus lanes, improved dispatching and scheduling practices, and the redesign of the city’s bus network, which hasn’t changed much since the streetcar era. To win those improvements, advocates have to convince elected officials to make them happen, but a lot of New York pols don’t have bus horror stories, because they don’t ride the bus. If they did, they wouldn’t be promoting Wi-Fi and charging stations as “21st century transportation” or attempting to thwart dedicated bus lanes. As part of the campaign to turn around NYC bus service, the Riders Alliance wants to hear your “Woes on the Bus” horror stories, which will help make the case for change to elected officials. You can submit your stories on the Riders Alliance website, and they’ll be compiled and shared with elected officials. In the meantime, stay tuned next Thursday, when the City Council transportation committee will hold an important oversight hearing on NYC bus service. Today the Bus Turnaround Coalition released an interactive site with district-level reports cards for every State Senate, Assembly, City Council and community board district in the city. For each district you can see average bus speeds and the share of buses that bunch together and arrive at stops at the same time. If good bus service was a priority for de Blasio, City Hall wouldn't let NYPD vehicles and delivery trucks obstruct bus lanes all over the city.